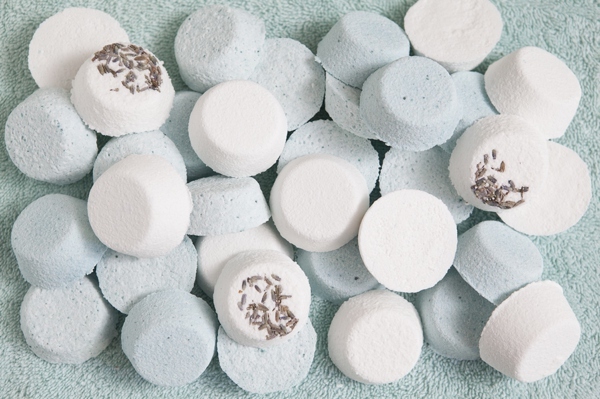 I throughly enjoy a relaxing soak in my tub… and bath bombs (or fizzie’s) always make bath time more enjoyable!!! Never again will I spend money on bath bombs because they are EXTREMELY easy to make, very inexpensive and I get to pick the scent and color. 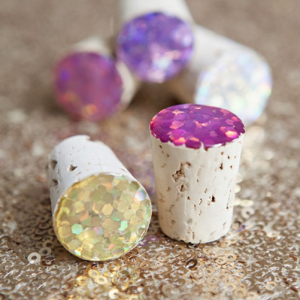 These would make absolutely fabulous bridal shower favors and since they set up fairly quickly you could even have your guests make them at your shower as a fun project! All of these supplies can easily be purchased online from BrambleBerry.com. 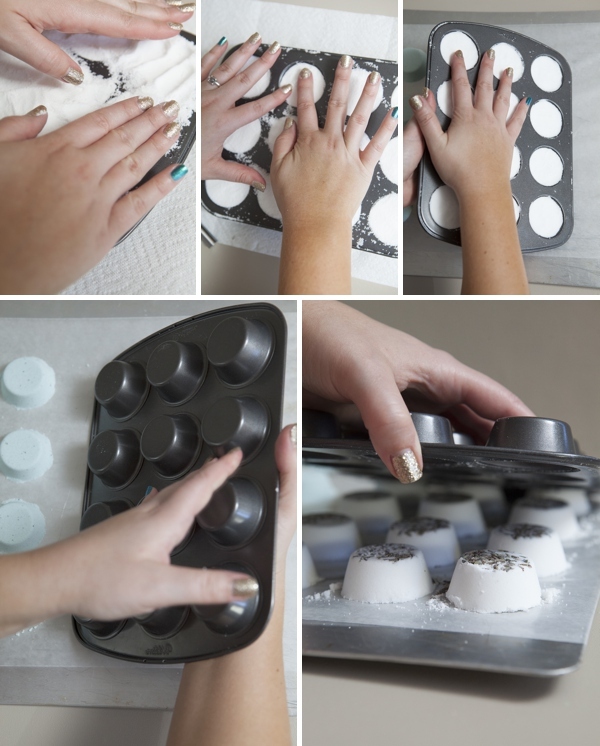 These are SO easy to make… I cannot wait for you to try them! The recipe below explains the proportions, except the fragrance and color amounts will be completely up to you! 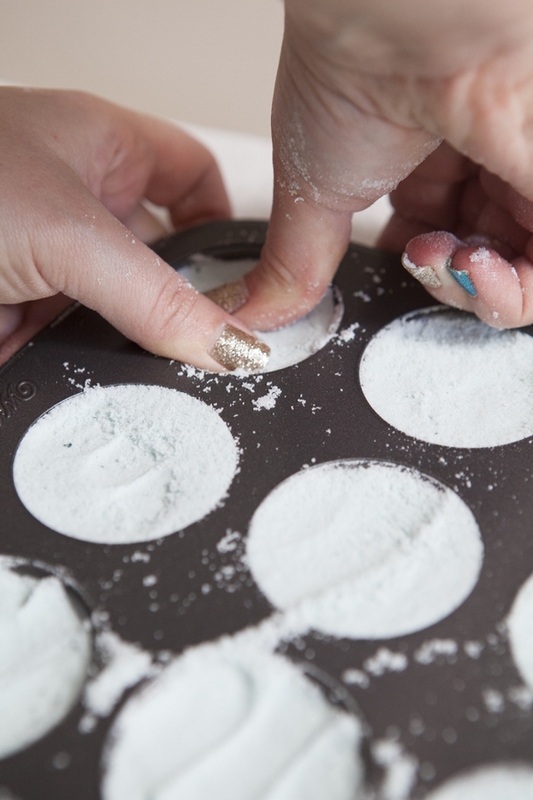 The batches we are making use 1 cup of baking soda to 1/2 cup of citric acid – which makes exactly 12 mini-muffin bath bombs. 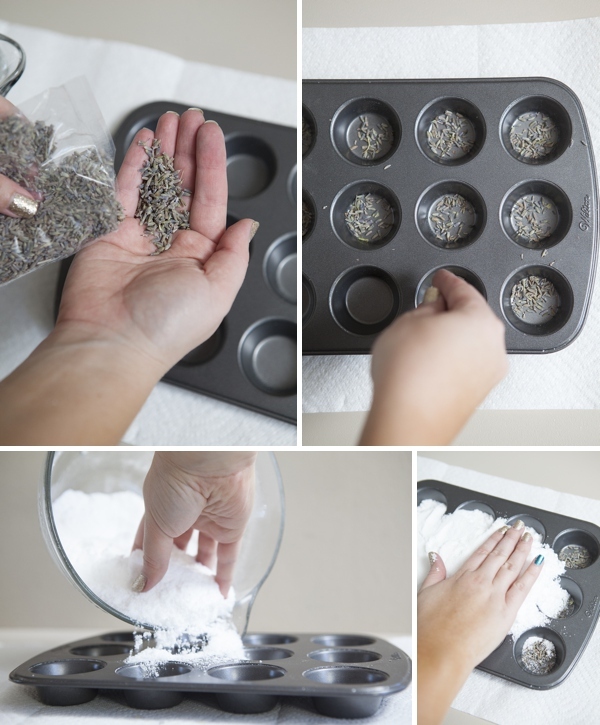 If you use the large 2lb baking soda that we are using here, and the 1lb citric acid bag from Bramble Berry – it will make exactly four, 12 mini-muffin batches – or 48 bath bombs! Making the average cost about $0.25 a bomb!!! 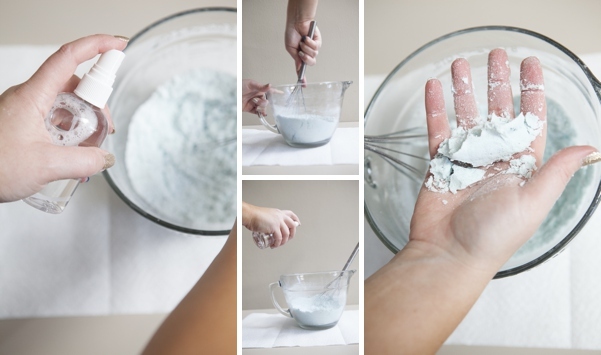 Start by adding one cup of baking soda to your mixing bowl and work out all the clumps. You can sift or use the food processor if you’d like! 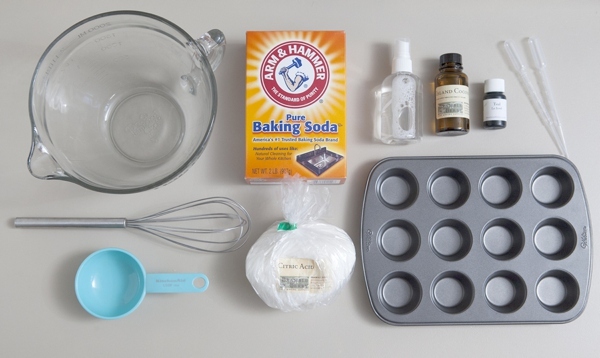 Next, add one half cup of citric acid to the baking soda – thoroughly mix and break up any clumps. 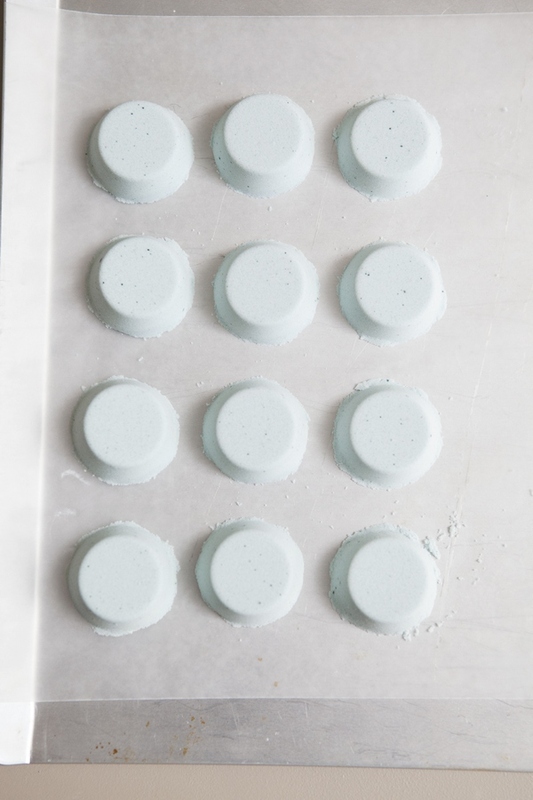 The smoother your mix – the smoother your bath bomb! Now for the fragrance oil – the amount is completely up to you. I used about three milliliters of Island Coconut per 1.5 cup batch. 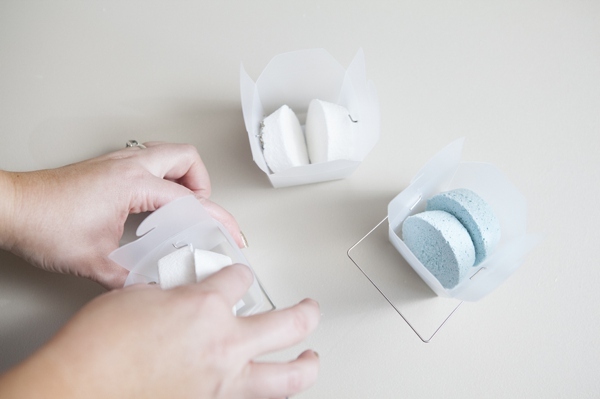 To get the right amount for you, smell your batch – if you can’t smell the fragrance enough add a little more. 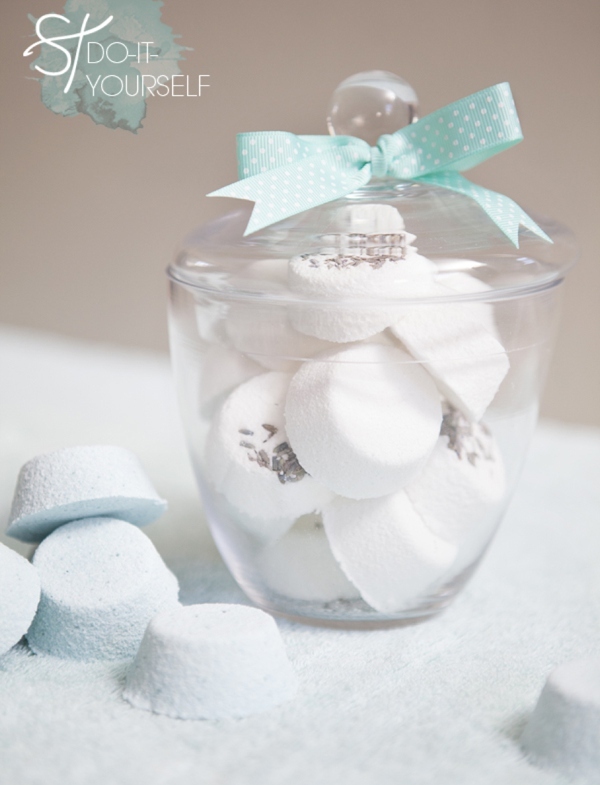 Remember, your bath water will dilute the fragrance oil so adding a little more isn’t a big deal. Thoroughly mix into the powders. Now add your colorant. You can ONLY use non-water based liquid color. If you use a liquid color that has water in it, the water will prematurely activate the bubbling of the bomb mixture. The La Bomb colors from Bramble Berry are specifically made for making bath bombs, so I would stick to using those. With the colorant, less is more. If there is too much color it can actually turn your bath water (although for kids – that would be a lot of fun!) and I think pastels make prettier bombs. 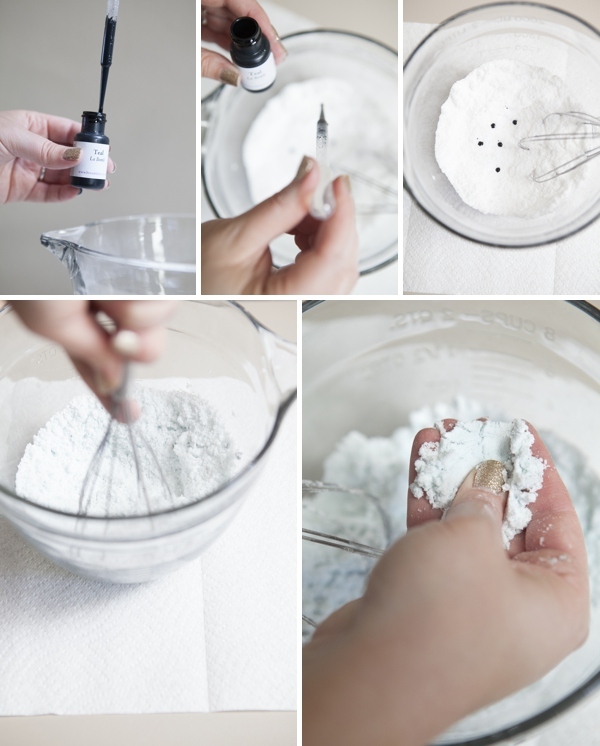 Thoroughly mix into the powders, using your fingers to break up color clumps if need be… *also keep in mind the next step brings out the color a little! Now for the witch hazel – which you need to add using a spray bottle. The amount is determined by your location. For arid climates, you will need more witch hazel – for humid climates you might not need any at all. I live in Southern California and I needed about 4 spritzes to get my mixture to clump in my hand (like below) when I squeezed it… which is what we are looking for. As soon as your mixture makes a nice clump – it’s ready! 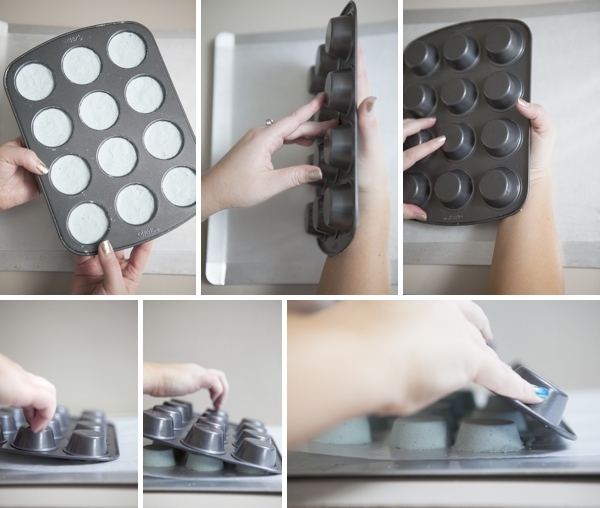 Make sure to REALLY pack the mixture HARD into your mold. Push until you can’t push anymore – this is what will keep your bomb together! 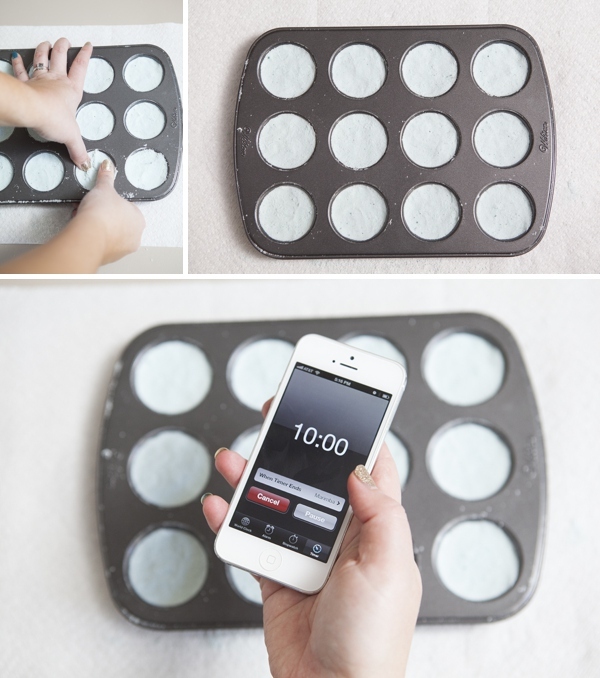 When the tray is completely packed – set a timer for 10 minutes and let them sit. 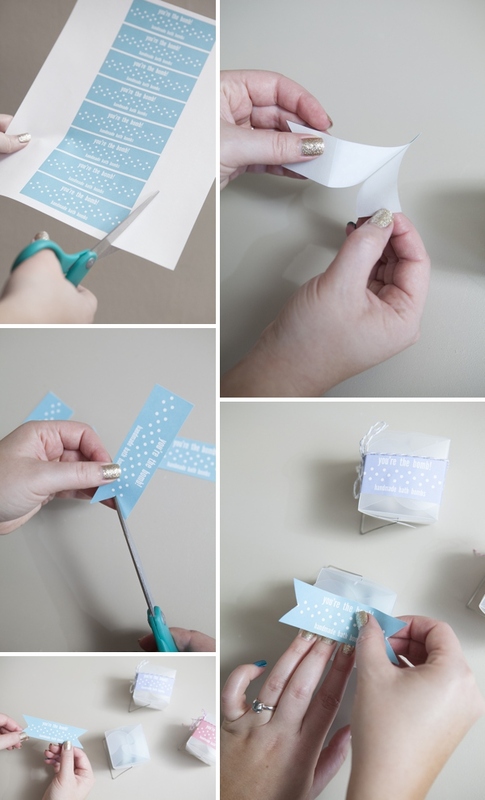 After the time is up, carefully turn them onto a sheet of wax paper to let them fully dry. You might have to give the tray a little tap-tap to release them. These need to dry for a few hours before moving them. Your dry time, again, will be different based on your area. Mine where absolutely perfect once they dried overnight. Yours might take a little longer or a little less. Make different shades of bombs for a fun ombre look or maybe add a few lavender buds to the tops of the bombs for an aromatherapy effect! I’ve even seen sprinkles added to them! 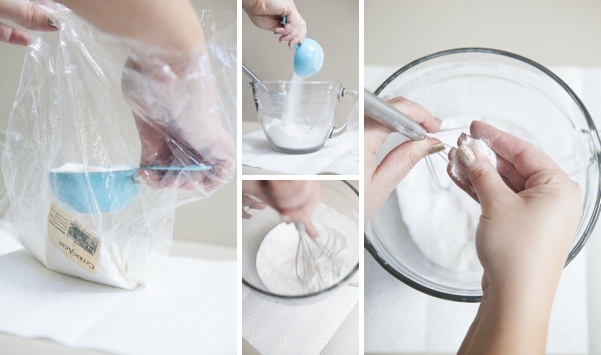 You can also mix different colors of powder in the same bombs! 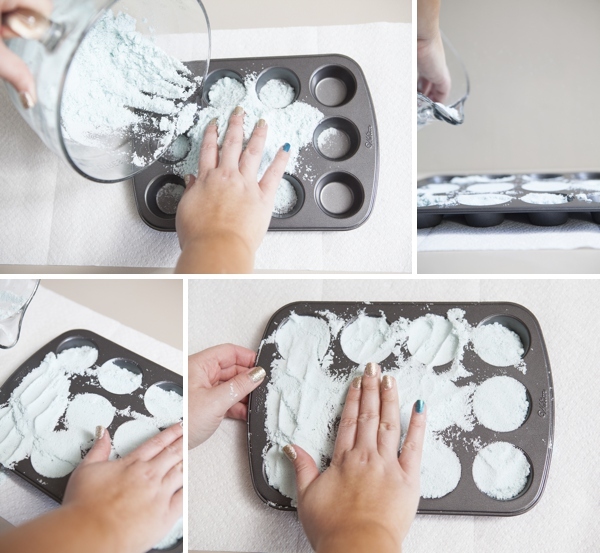 Just remember to REALLY press the mixture as hard as you can into the mold! 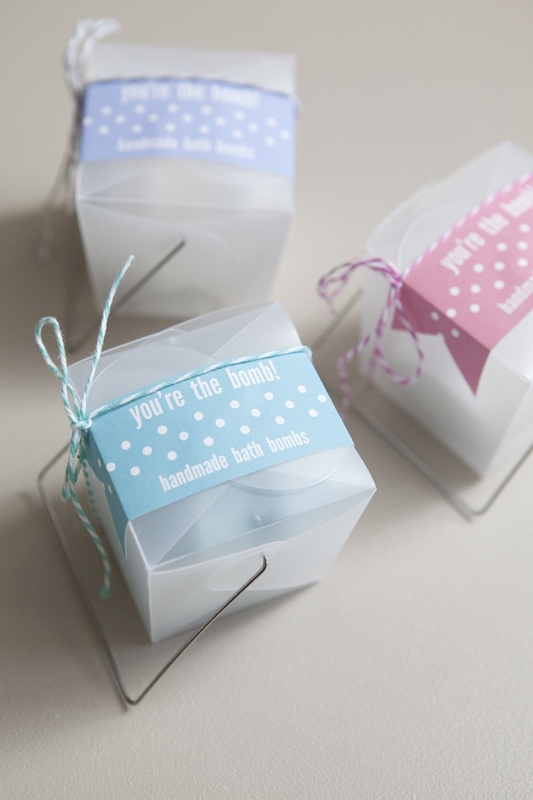 Now for a little fun favor packaging! 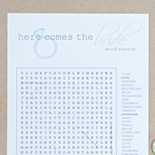 Download and print the labels above onto sticker paper. You can also design your own! 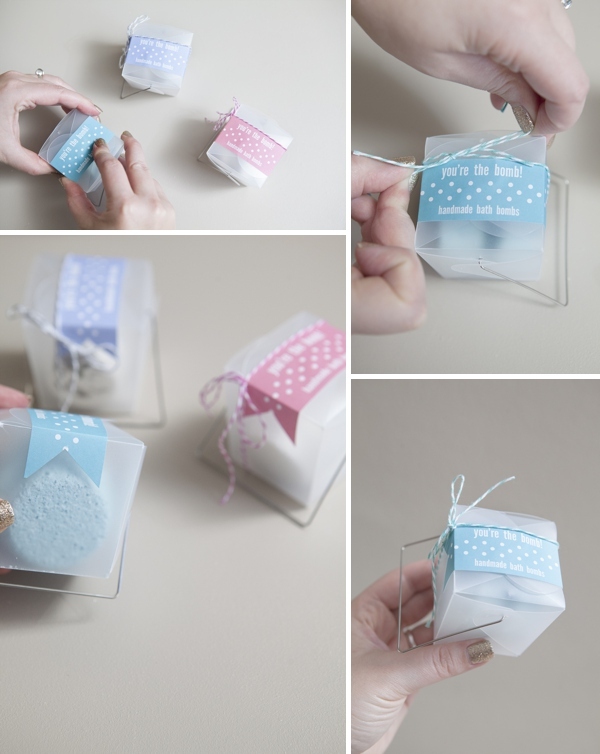 Cut them out, add some cute twine and you’ll have a darling – and relaxing – favor! Your the bomb. So are these. 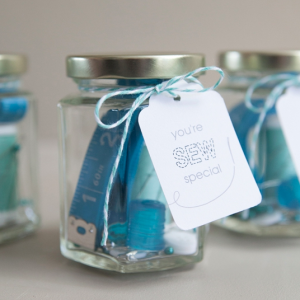 These are such a cute idea, I really wish they had worked for me. I put about 5-6 sprays of witch hazel and only some of it was clumpy. I didn't want to over-do it so I put them in the molds. Most of it was loose and powdery. After 10 minutes the ones with the witch hazel were foamy on top and the others were flat. I kept them in the mold a few more minutes. When I tried to take them out of the molds the foamy ones didn't keep their shape the others fell apart completely. Help! I really want to make these work. Hi Deb. I'm not sure I understand you completely, but... it sounds like you made 2 batches - one with witch hazel and one without. You need to stir the witch hazel into the batch, if only some was clumpy you probably needed to slowly add more. 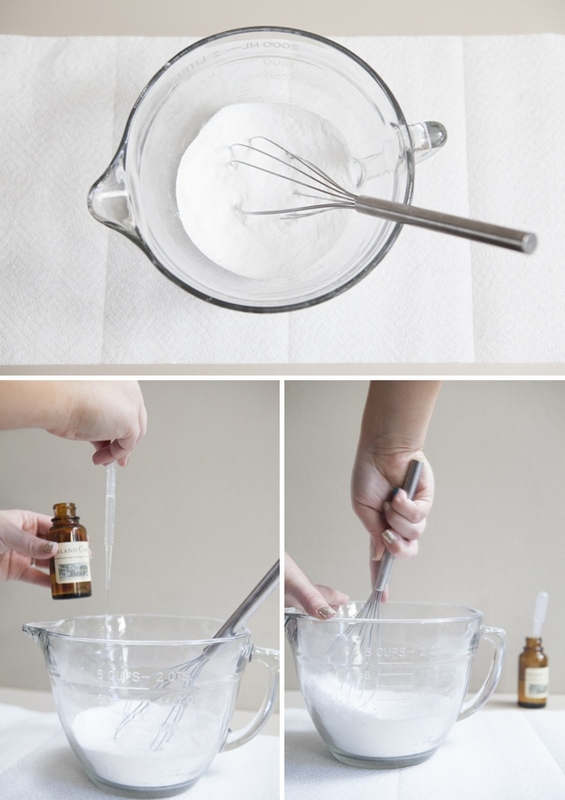 You can add one spray, stir, add another spray and stir until you get a uniform clumpy batch. If they are foaming up, that is a sign of water - they should not be foaming or have any water near them. I'm not sure what 'flat' means. You really need to pack them as HARD as you can into the molds. **Remember, if you are in a humid area - you will need less witch hazel. If you are in a dry area you will need more! Hope this helps. Thanks for the fast reply. I did mix the witch hazel in but only some of it was clumpy and was afraid if I added too much witch hazel it was going to ruin it. I just made one batch. Thanks! 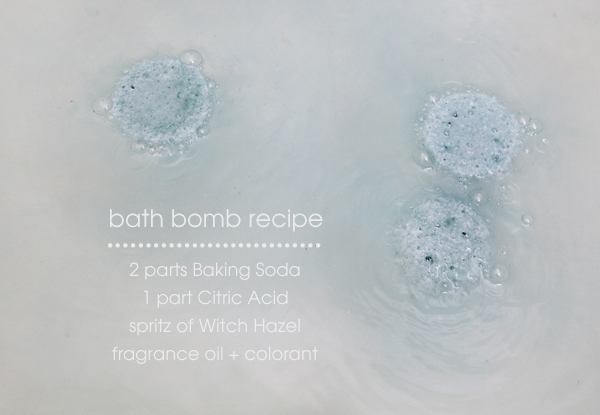 Tried this again with mixing the witch hazel into the complete mixture. Worked great! Thanks again! I was really excited to make these for Christmas presents, but they didn't work out at all. Once I added them to the mold they started rising like yeast dough. I left them alone for an extra 15 minutes and they wouldn't come out of the mold at all. I ended up scooping them out and they look like scoops of ice cream. I can't use these for gifts unfortunately due to the less than pleasing presentation, but will use them for myself if they are still functional. I'm not sure what went wrong, but this one was a big fail. Hi EJ! I agree, that sounds like a big fail. Guess what! The answer is very simple... there was water involved somewhere! This mixture will not expand, grow, or fizz without the introduction of water (or way way way too much Witch Hazel). So it sounds like your mold might have been a little wet or something. Try again and make sure there is no water near them... don't even turn on your faucet if they are near it on the counter, even one little drop will set off the 'fizz' reaction!